Today, Amy & Brad (henseforth to be called A&B or B&A), Brittney and I went into the closest small village, San Pedro Columbia. A&B are awesome! They crack me up nonstop and remind me so much of my Brother and Sis-in-Law which is even more awesome. It's like living right next to family...smokin' drinkin' meat eaters…all the things which we do not have on the farm. We ended up in a little bar which A&B had gone to the week before. The bar sells 2 beers, regular (4.6 % alcohol) and stout (6.8%). I had a couple regular ones and knew right away that I was in desperate need of food. It was about 1 o’clock and none of us had eaten since breakfast. Margarette, the owner didn’t have any food. She said that if we would have told her when we first came in that we would want food, she would have butchered one of the many chickens running around in the yard for us. I told her that I don’t eat chicken and said that if she had any rice, that would be fine. She went next door to her house, came back and said that in a couple hours her daughter would be cooking and I could buy a plate of it. 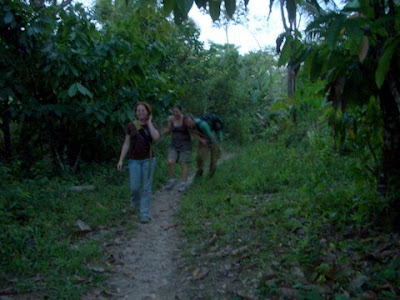 The walk into the village took about an hour long and consisted of crossing the river and then hiking up a huge steep hill and then walking through the rain forest until we came upon a road. The road leads into the village, past the school. I could really see myself working in a school such as that one, teaching preschool or something. The cool thing is that I felt so completely comfortable in this environment. It seems like I have been here for months instead of only 7 days. The people in this area are predominantly of Mayan heritage and everyone I have met is super nice. Once we finally left the bar, it was getting dark and the long walk home became kind of scary going through the dark "jungle". We made it to the river safely and were so hot and sweaty that we just jumped in to cool off. I am getting over my fear of swimming in dark water!